In this post I will discuss the process that lead to the creation of the comic, the efforts that went into getting the KickStarter campaign together, and the promotional efforts there were undertaken. It started with a simple idea. 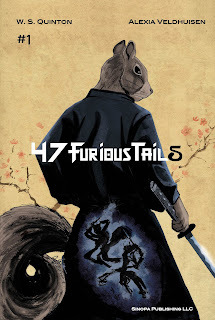 Develop a comic book retelling of the 47 Ronin story with squirrel themed characters. The problem was that I am a writer and not a comic book artist. When I say that I'm being kind. I draw the most amazing stick figures, if you like weirdly shaped stick figures. So as I was putting ideas for various projects down on paper it occurred to me that I work with remarkable artists every day. So I put my list of project ideas on a work group page I share with the artists. People began picking projects they wanted to be a part of. 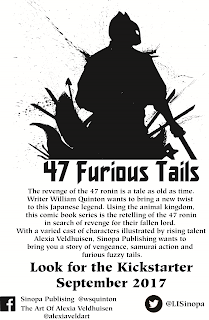 Zach Viola took up the rpg weapon supplement source book and Alexia Veldhuisen claimed that 47 Furious Tails would be hers. Development began systemically, at the high level overview point, with the establishment of the timeline. Time for writing, developing the KickStarter campaign, funding of the KickStarter and payment cycle, art development, printing/shipping, and then backer fulfillment were calculated. Then, as with all projects, I padded that estimate to account for whatever may go wrong. Writing began almost immediately. It started with an outline of the series. Being that the story is based upon the Ako incident, I knew it was going to be a limited series. After outlining individual issues I came up with a final issue count of twelve. I liked the idea of bringing such substance to the retelling that a dozen issues are needed. While the KickStarter is focused on funding issue number 1, the subsequent issues will see their own KickStarter campaigns (unless funding reaching phenomenal levels that would allow me to forego such). Following the outline of the series, development of central character biographies was completed. This process was fairly simply except for the background and historical data that was collected and researched. This is a story with a lot of cultural impact. It would be disgraceful not to have done the reading, checked the history, and done due diligence. Literary liberties are taken to fill in the blanks in the chronology, historic and literary accounts. I was riding a wave of excitement as I went from the character biographies to writing out issue number one. The very first comic book draft I had ever undertaken. Surprisingly, it took several hours to write. More time followed as the book's pacing and panel layout were conceptualized. A re-write was done to make the comic flow more smoothly. To make a change to the page layout and to bring certain scenes more space in the book, another series of edits were made. While writing was being completed, Alexia was drafting concept character art, reviewing research notes, reviewing the outline, character biographies, and story drafts. Alexia then moved forward with promotional flyer development, began refining the character sketches, and did an initial layout of the cover concept. Alexia and I approached the development of the book dependent upon the KickStarter funding. As the art will entail weeks of time dedicated to the illustration, inking, coloring, and lettering of the book; it is necessary to have funding established before Alexia can devote herself to that period of time. See my previous entries regarding how to treat your artists. No one should have to work for free, and I (as a writer, publisher, and human being) think she deserves to be well paid for bringing such beautiful art to this tale. She will be once funding is secured. This is my third KickStarter campaign, but the first one I've done for a comic book. I've been conducting research by looking over other KickStarter campaigns for comic books. That may seem rather remedial, but it is a critical step in development. Never assume you know everything, or know the best way to do something. Always do your research, analyse your findings, and make as objective a determination as you possibly can. If you want your KickStarter to succeed, you owe it to yourself and to your contributors to discover as much as you can about what has worked and what hasn't. Even now, with a mere six days to go before I submit my KickStarter campaign for approval, I continue to look at what is on KickStarter and how each campaign is fairing. Keeping an eye on the community and its response to particular campaigns may seem tedious, but I believe it is a valuable reference when crafting your own campaign. I recommend that you undertake the same efforts before launching your own campaign. Promoting KickStarter campaigns is a business that is taxing to your time and absolutely essential to your success. Personally, I don't use promotional services. I don't use them because I can't afford to, I don't like the idea of those services in general, I have not been able to find any evidence supporting the claim that they are useful, and I like to do things openly and organically. I don't like to resort to marketing gimmicks and ploys, so I don't. Promoting this KickStarter has been dependent upon a gradual build up of the social media campaign, as well as networking with friends and relatives, and this blog, to set up for the launch. Launch party hasn't been implemented, but I'm going to work on that this week. For future reference, don't do that. Plan your launch party and get it in place a month or more in advance. Unlike my first two KickStarter campaigns, I'm having a video prepared for this campaign. KickStarter likes to remind every creator that a good video greatly increases your chances for success. After reviewing dozens of campaigns and noting what appears to be a correlation (for my fellow math nerds, yes I know that doesn't imply causation) between those campaigns with solid video value and those without, I'm going for the video. This is the plan, assuming the project funds fully. I know, I'm optimistic, it is a huge funding goal. You have to have a fulfillment plan in place folks. Don't just say "I'll ship them". Do the math on your costs (postage, envelopes, supplies, time to pack the items, how many trips will you make to the post office, etc). Alexia will be working on the book full time for completion. She will complete the book within 30 days of the end of the KickStarter campaign itself (so in December). She will be paid as soon as KickStarter releases the funds from the (hopefully) successful campaign. Digital files will be uploaded, and print copies will be ordered. The print copies will take two months to be delivered to me (February to early March). Print copies requiring signing will be signed by myself and Alexia. I will package and prepare for shipping all print copy rewards. These will begin shipping in March with estimated arrival during late March and early April (for backers outside the United States). Notice that as I've allowed for a few weeks for fulfillment. Physical copies will be bagged and boarded then shipped. I'm making every effort to ship these comics in way to have them arrive safely. They are going out by USPS and should arrive in good condition. I'll trigger the fulfillment of the digital copies on or before April 2nd. All physical copies should be either on their way to the backers or in the hands of the backers. Putting all electronic copies out in pace with physical fulfillment is just polite. So there you have it. The summary of the chain of events that are taking me to this new part of the adventure. As a new medium for publication comic books are an exciting thing for me to be getting involved with. I hope that as Christmas 2017 rolls around I'll be looking forward to 2018 and the release of this title. Thank you for joining me on my adventure. As we continue to explore the world of writing and self-publishing, I hope you enjoy and benefit from my experiences. I hope to see you for my next release. Please do share this article with others. 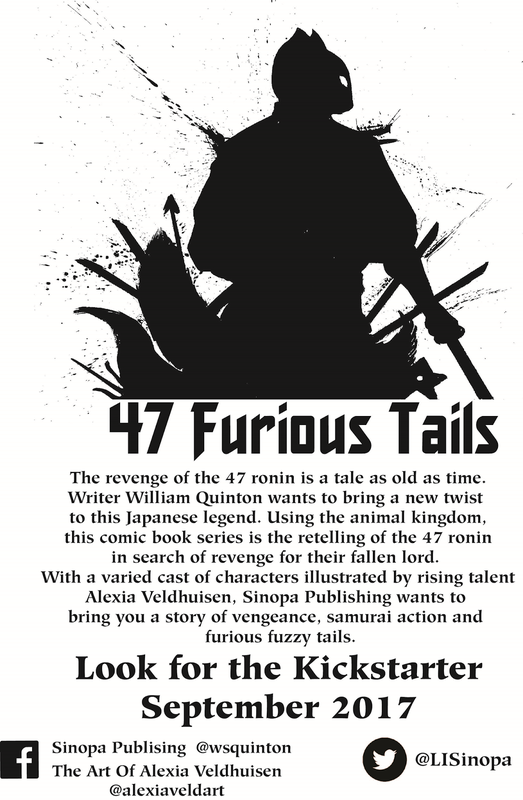 I hope you will check out the KickStarter for 47 Furious Tails on September 14th. Please do share that information around as well.